Two major trends impacting cooling tower market outlook, U.S. to emerge as a prime regional hub by 2025 « Global Market Insights, Inc. The robust trend of industrialization is majorly responsible for stimulating the global cooling tower market over the coming years. While the industry is largely being fed by the massive number of thermal power plants, which have been actively running to meet the growing energy demands for decades, recently the industry has been witnessing a shift with the increasing adoption of a plethora of sustainable energy sources. This has effectively replaced conventional thermal power plants, creating a lucrative growth avenue for the expansion of the cooling tower industry. The cooling tower market is projected to accumulate sizable growth from this ongoing shift, which is primarily being driven by the rising consumer & environmental awareness, with sustainable power generation techniques such as cogeneration technologies at the helm. Meanwhile, as global temperatures continue to rise the market is also expected to witness increased demands from the world’s HVAC sector with different industries attempting to control internal temperature to maintain a conducive work environment for their employees as well as their equipment & machinery. Being an essential part of the heating, ventilation, & air conditioning (HVAC) systems, cooling towers have witnessed extensive capacity demands from a plethora of different sectors. While industrial cooling towers are utilized without any problems inside power plants, petrochemical facilities, petroleum refineries and other industrial facilities, other cooling tower application sectors face a major issue that may make the system a significant health risk to individuals. The issue is a harmful lung infection called Legionnaires’ Disease. The disease is caused by the Legionella bacteria, which thrives in warm water conditions and could affect humans if they inhale the mist or water vapor containing the bacteria. While, the disease was the matter of concern back in the 1970’s, the problem still persists today. In fact, according to Becker’s Clinical Leadership & Infection Control, a study conducted in 2016 discovered that more than 84% of cooling towers in the U.S. contained Legionella. The technology cosmos is getting more concerned about the heat produced in data centers on a daily basis. These facilities require an extremely reliable system to efficiently maintain the power, cooling as well as support systems that are extremely crucial for ensuring continuous flow of information across these mission-critical facilities. Achieving close to a 100% availability or uptime at data centers has become a necessity as loss of power in data centers could cost the organization millions of dollars, thus making cooling towers extremely crucial for the future of data storage & cloud computing. Moreover, according to the U.S. Department of Commerce, the hyperscale trend has recently taken the data center industry by a storm. Data center projects in the 150,000 sq. foot and $120 million range, are now considered small while facilities in the 600,000 to 1,000,000 sq. foot and $1 billion range are now becoming the industry norm. This significant boost in scale coupled with the ongoing rise in the number of data center facilities is expected to one of the primary growth inducing factors for the global cooling tower market in the coming years. Speaking of the regional spectrum, it is vital to mention that the U.S. is bound to be one of the most proactive hubs for the growth of the cooling tower market. Powered by a highly favorable regulatory spectrum, U.S. cooling tower market was worth USD 250 million in 2018. In the years ahead, the U.S. cooling tower industry is anticipated to garner substantial returns, driven by the paradigm shift in the administrative policies and the robust expansion of the regional manufacturing sector. 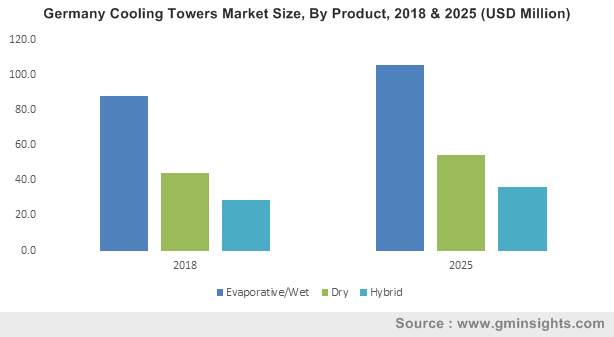 It is quite apparent from the aforementioned trends that the global cooling tower market is primed for drawing in sizable growth over 2019-2025. Propelled by the expansion of the industrial sector and the hefty adoption of sustainable resources, the global cooling tower industry size is projected to surpass a valuation of more than $3 billion by 2025. This entry was posted in HVAC and Construction and tagged APAC Cooling Tower Market, Closed Circuit, Cooling Tower Industry, Cooling Tower Industry analysis, Cooling Tower Market, Cooling Tower Market 2019, Cooling Tower Market 2025, Cooling Tower Market forecast, Cooling Tower Market Growth, Cooling Tower Market report, Cooling Tower Market share, Cooling Tower Market size, Cooling Tower Market trends, Dry, Europe Cooling Tower Market, Hybrid Evaporative/Wet, North America Cooling Tower Market, Open Circuit, U.S. Cooling Tower Market.